Clarence B. Sprouse was the son of the late Rev. Henry Sprouse and Bessie Kirk Sprouse. He was born April 13, 1925, in Mingo County, West Virginia. Retired Army Maj. Clarence Sprouse, a veteran of World War II, Korea and Vietnam who a four-star general once called Ã¢Â€Âœthe perfect soldier,Ã¢Â€Â� died Tuesday in San Antonio. He was 93. His legend went beyond the three wars: he also helped train the exiles who fought in the failed Bay of Pigs invasion in Cuba in 1961. He told me I was the bravest guy that hes ever seen, and, really, I was not, Sprouse once said about Gen. William DuPuy, who had dubbed him the perfect soldier. DuPuy was known for his role in restructuring the Army after Vietnam. Sprouse had recently suffered a broken hip and struggled to recover, said San Antonio attorney Morton Baird, an old friend. Before that, he had been healthy and sharp, often meeting with Baird and others once a week for lunch at a local seafood restaurant. The order was always the same Ã¢Â€Â” a fish sandwich and a glass of beer. A great American and a great hero, Baird said of Sprouse. A paratrooper who was the first soldier in the 11th Airborne Division to make 100 static line jumps and held more than 80 decorations when he retired here in 1968, Sprouse received two Silver Stars, five Bronze Stars for valor, 18 Air Medals for assault landings, and three Combat Infantryman badges. He began his career as an enlistee and rose to sergeant major of both the 82nd Airborne Division and the 1st Infantry Division before he earned a battlefield commission as an officer. Sprouse was the chief trainer for 2,000 exiles who spent a year at Trax Base in 1959 in a mountainous region of Guatemala. Brigade 2506 later earned notoriety for the ill-fated invasion of Cuba early in the Kennedy administration. In a 2012 interview, Sprouse thumbed through a thick album packed with 154 black-and-white photos documenting his time with the Cubans. In one image, three soldiers in the unit's honor guard hold the brigades flag. Spouse grew up in Delbarton, West Virginia. His father was a coal miner by day and a preacher by night who held his revivals in schoolhouses and churches. Everyone in his family of five boys and four girls worked in coal mines. One brother Ã¢Â€Â” Noah Ã¢Â€Â” died in a 1944 battle in New Guinea. I liked it, Sprouse said about working in the coal mines. It was 60-degree weather. Back home after the war, he returned to the mines but rejoined the Army as a staff sergeant in 1949 after work was cut back to three days a week. Soon after, the Korean War broke out. When interviewed six years ago, his voice was that of a soldier given to using colorful language that includes politically incorrect references to old enemies. The men he served with only had last names, among them Victor and Duncan. War stories flowed like a stream of consciousness, complete with tales of death and misery and hard living, bad decisions that cost lives and a tough enemy. There was no hint that Sprouse realized that his words and stories might fit in better with an era most know only in movies, books and museums, that time had passed him by. 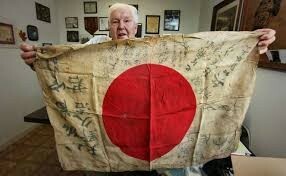 When asked about the blood he spilled, he unfolded the Japanese flag with a bullet in the red rising sun. There were no nights of lost sleep. He had it tied around his body,Ã¢Â€Â� Sprouse said. Ã¢Â€ÂœSee that hole in it? ThatÃ¢Â€Â™s probably where the bullet got him. It was war. I was there to kill them, he said. They didn't kill you, so you felt OK. There were many memories of desperate fights. In one, a Chinese soldier in Korea jumped in front of him and opened fire. There was no time to shoot back, so Sprouse did the only thing left. I jumped on top of him, beat him to death with my rifle, he said, no emotion in his voice. Somehow, Sprouse said, he was never even scratched in all the fighting, and he didnÃ¢Â€Â™t dwell on dying while killing more Japanese troops in WWII than anyone in his company Ã¢Â€Â” 37 in all. I did not think I was going to be killed every damned day, and a lot of these people that thought they were going to draw their last breath anytime, Sprouse said. But I thought if one man survived, it would be me, and several cases it was and IÃ¢Â€Â™ve never been wounded. His wife, Charlotte Imogene Sprouse, is buried at Fort Sam Houston National Cemetery. The couple had three children, son Kelly Sprouse, and two daughters, Kimberley Zoeller and Sharon Joyce, all of San Antonio. Services are pending.